Legend has it that a miracle once occurred out in the Argentinian deserts I’ve been driving through the past couple of days. So amazing and so unbelievable, the story of the miracle was to be shared down through generations. As the years passed and the story recited to fresh ears, a portrait of a saint would emerge – a poor peasant woman who would become a figure of religious devotion. Now, today, the legend is as strong as ever and it brings more than half a million people a year on a pilgrimage to worship at her grave. In the 1830s or 1840s (no one is quite clear) a young woman set out into the desert with her baby to find her sick husband. He had been forcibly recruited into the Argentinian Civil War but abandoned when he fell ill.
She never made it to him, though. On a track in the San Juan province she died and her body wasn’t found for days. But when it was found, there, lying next to her, was her baby, alive and healthy. It had been suckling from her breast which had never run out of milk, despite her death days earlier. The story of the miracle began of the woman who, in her death, gave life when all hope should have been lost. She was buried on top of a hill in a town that is now called Vallecito and became known as Difunta Correa (literally ‘the deceased Correa’). As the story spread, people began to believe she had the power to save travellers. Shrines were built along roadsides across the whole region, where worshippers left bottles of water as an offering to quench her eternal thirst. But it was on the hillside where she was laid to rest that the largest sanctuary was to emerge. Over the years, the entire hill has become a place of devotion. 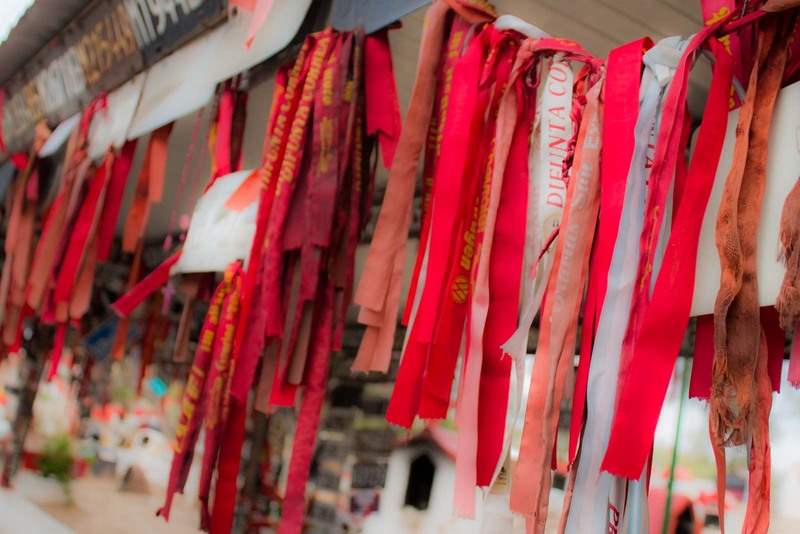 About 20 shrines have been built on the site, hundreds of model houses have been erected in tribute, red ribbons tied, car number plates affixed and, of course, hundreds of bottles of water offered. Almost every spare bit of space on the mountain has been covered with an offering of some type. A whole town has sprung up around the mountain to cater to the huge number of visitors who come each day. Difunta Correa has never been officially recognised by the Catholic Church but that doesn’t bother her supporters. In their minds, she is the patron saint of truck-drivers, of travellers, of farmers, and all those who may need the life-saving suckle of a breast. It’s estimated that more than 500 thousand people visit this hill in Vallecito each year to ask for her help in times of trouble. Now, I’m one of them. I didn’t intend to go here – it was an unexpected stop on the way somewhere else. Perhaps one day, though, I’ll need a miracle and Difunta Correa will be there for me. Wow so cool. I had never heard this story, but it’s sweet and the shrines are so colorful. There was a corner in Buenos Aires near the zoo that always had random red clothing, ribbons and items tied to it, I never understood it. I wonder if it’s related. I had never heard of it either until we went past the hill with all the shrines and everything. Perhaps the red ribbons in BA are related – not sure, but I’ve definitely seen a lot of the water bottle offerings on the road now.